'Vedi Napoli e poi muori!' goes the famous phrase - 'See Naples and die!'. It might not have the same ring to it in English, but Naples is truly a city that rests long in the memory. A city with a fascinating history, a beautiful coastline and a live volcano! It goes without saying that the food here truly is to die for, as the home of many Italian classic dishes, including the pizza. 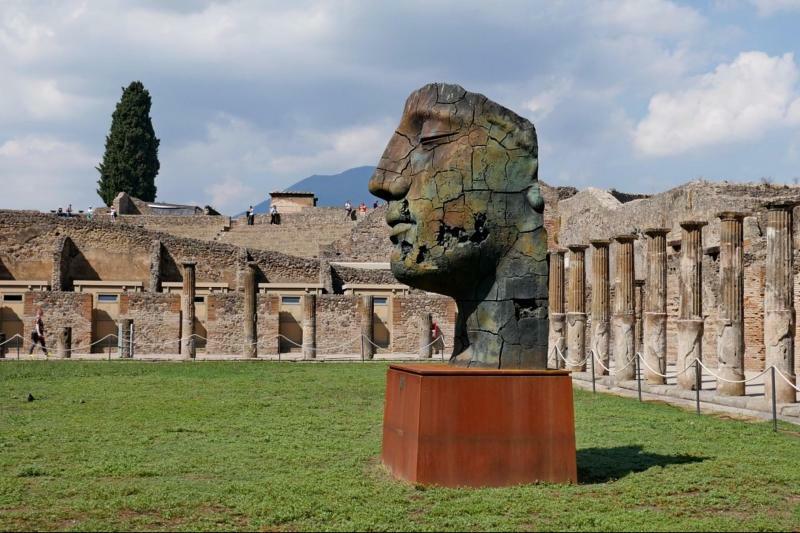 This break offers you the chance to discover the ruins of Pompeii and also learn about the city on a half day guided tour. Stop off for a pizza one lunchtime and experience authentic Naples in just 3 days! 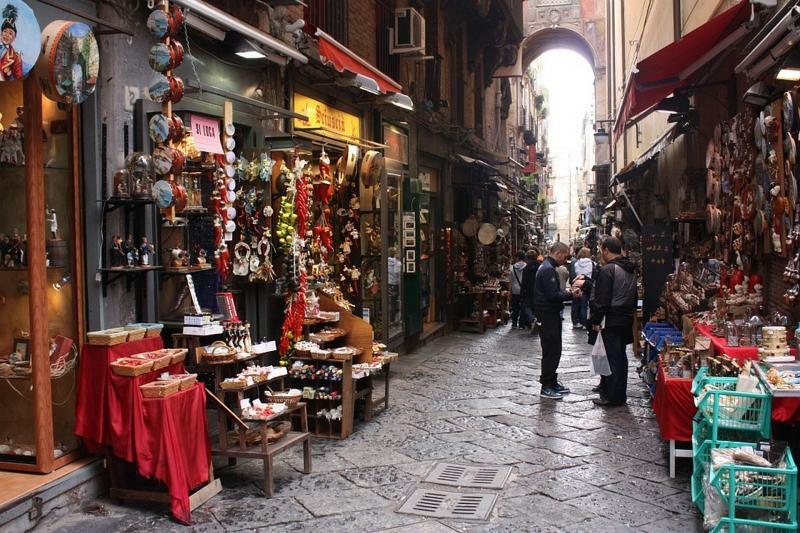 During the city tour you will visit the historic centre of Naples, local artisans and street food vendors, subterranean Naples, the Toledo underground station (voted the most impressive in Europe by the Daily Telegraph), the Galleria Umberto, Piazza del Plebiscito, Castel Nuovo (outside), palazzo reale (outside) , Spaccanapoli and Via San Gregorio Armeno, famous for its Christmas nativity ornaments. There will also be time for shopping and photos. Transfers to Pompeii depart at 8.00am and return around 1.30-2.30pm. The guided tour also starts at 8am so some early starts are involved! Where to begin? 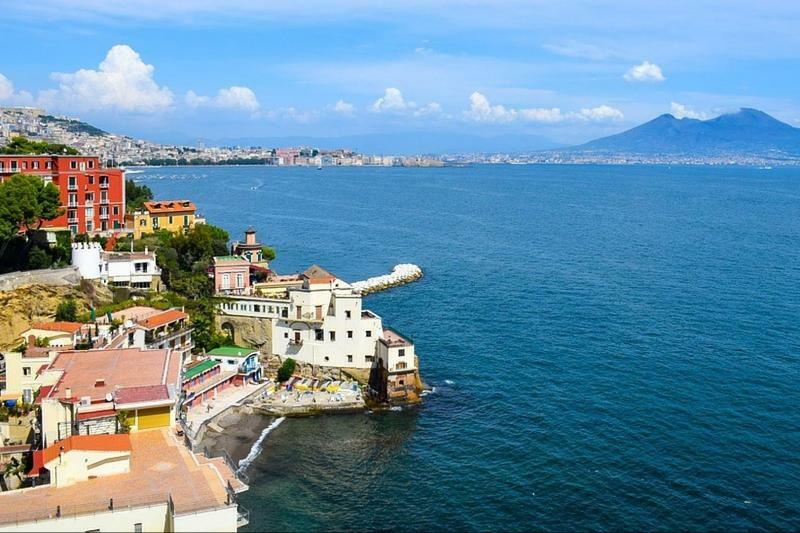 Naples is Italy's third largest city, sitting on the wide gulf of Naples in the South west of Italy, around one hour south of Rome; the distinctive outline of Vesuvius is visible from the other side of the bay. A vibrant, often chaotic, port city, one of the oldest in Europe, Naples is a fascinating destination for art and history lovers. Pompeii, the ancient Roman town destroyed by the eruption of nearby Vesuvius in AD79, is a fascinating place to visit, full of well preserved mosaics and frescos. It gives real insight to the everyday lives of people at that time, as does the smaller and less well known Herculaneum nearby. 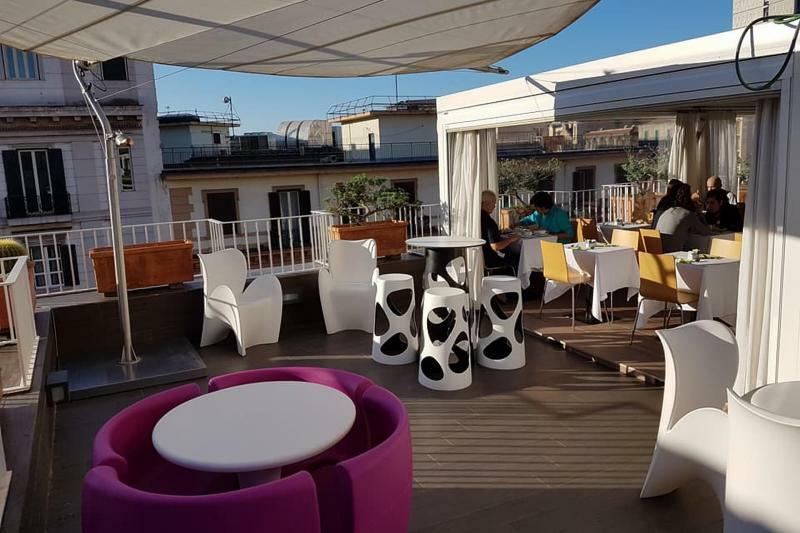 Food is a reason in itself to visit the city, the home of the classic margherita pizza (many Neopolitans balk at the idea of adding more toppings), other highlights include spaghetti alle vongole (spaghetti with clams) and heavenly sweet pastries. There is so much to see and do here and in the area that you will barely scratch the surface in three days, however if you have time you could extend your stay and travel to the islands of Ischia and Capri, or head down to Sorrento and the wonderful Amalfi coast. 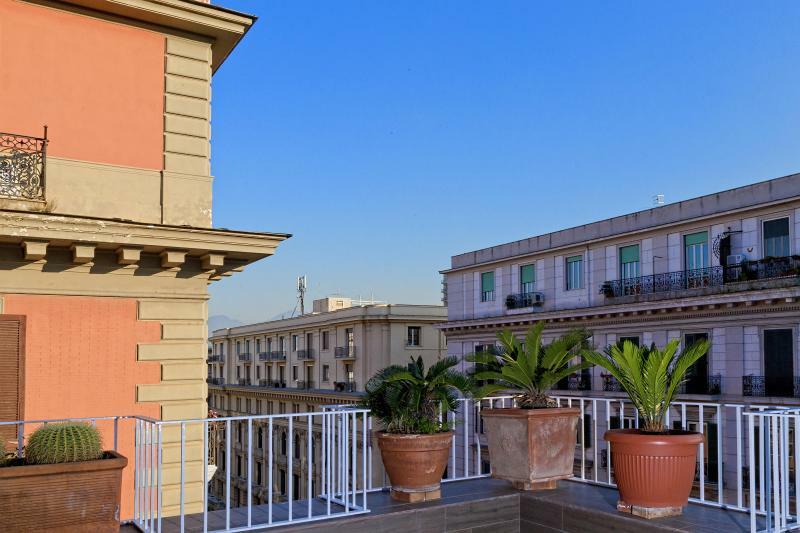 This hotel is located in the centre of Naples, ideal for sightseeing and close to lots of good restaurants. There is a 24 hour reception. 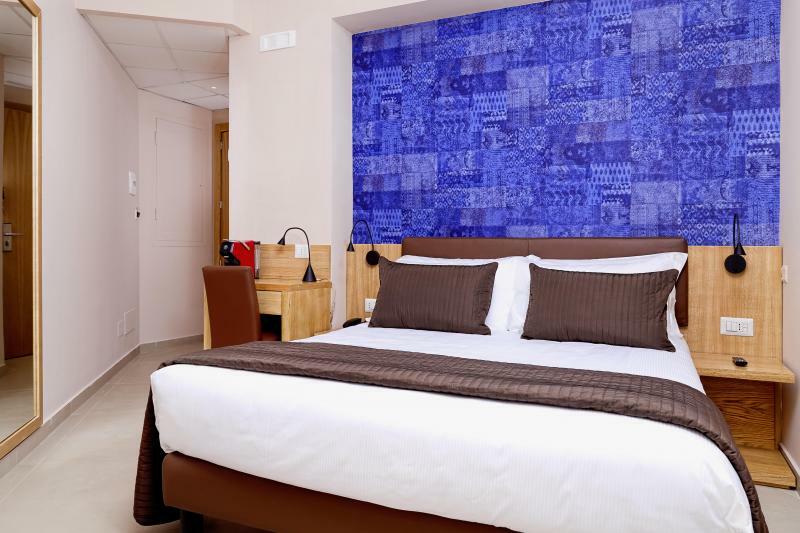 The stylish, modern rooms offer a balcony, air conditioning, free WiFi, TV, safe, bathroom with shower and hairdryer. 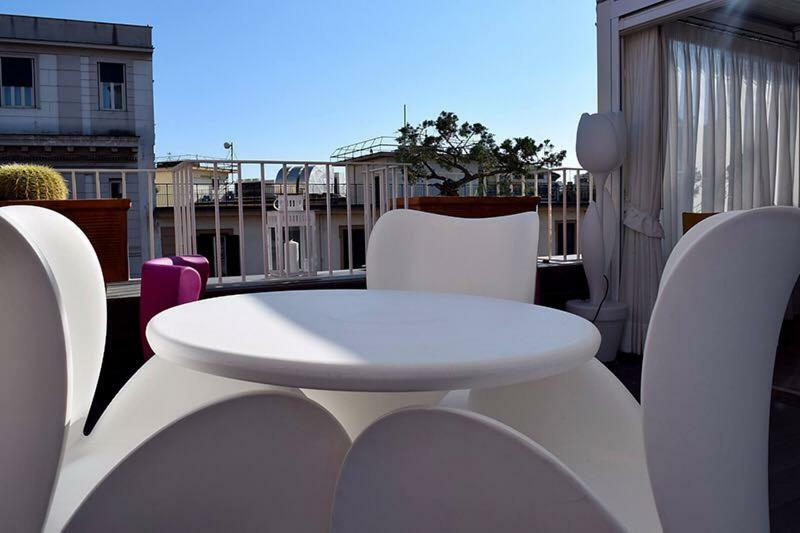 An Italian style breakfast is served in your room (on request), in the breakfast room or out on the roof garden, which offers great views over the city. Take Viale F. Ruffo di Calabria, Exit 4 and Corso Malta to Via Generale Francesco Pignatelli. Take an airport bus (ALIBUS) to Molo Beverello, a 5 minute walk from the hotel. Taxi available from outside the airport, fixed price € 23 each way.